Emu Oil has been used for thousands of years by the Australian Aboriginal people for its natural healing ability for muscle strains and joint pains. Traditionally, Aboriginal peoples used Emu Oil in various ways such as dripping oil on affected areas or hanging fresh Emu skins around. Emu Oil has great skin penetration ability and helps healing of joint pains and various conditions. In the last ten years, clinic experiences have revealed many therapeutical benefits of Emu Oil, which include Rheumatoid Arthritis, joint pains, muscle strain and sprains, sport related injuries, bruises and other conditions. The Emu Oil used in this formulation is fully refined Australian Emu Oil, from the feathers of Emus farmed in the outback of Australia and processed in USDA and EEC standards to retain the highest quality. Extra Strength Trans Wood Lock Liniment with Emu Oil combines thousand years of traditional with modern medical pharmacology, it blends Australian Emu Oil with traditional Chinese remedies. It brings to you sure relief of joint pains, back aches, strains and muscle stiffness. 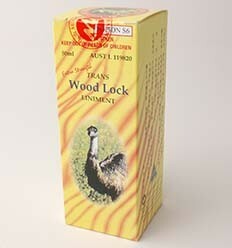 Extra Strength Trans Wood Lock Liniment with Emu Oil is manufactured in Australia, under the strict guidelines of GMP. It is listed with the Australian health regulator, TGA. TGA approved no. Austr 58935. Active Ingredients (per 100ml): Australian Emu Oil 15ml; Turpentine Oil 17ml; Wintergreen Oil 24ml; Ginger Oil 2ml; Camphor Oil Brown 8ml; Also contains Menthol and Capsicum Oil which makes this product hotter than the normal Trans Wood Lock Liniment with Emu Oil (WO04). Indication: For temporary relief of pain from arthritis; rheumatism; relief from muscular aches & pains; strains; sprains and joint pains; for injured ligaments; bruises; nerve pains; especially for lower back and neck pain; shoulders and elbows inflammation; or any sport related injuries. Direction: Apply a generous amount to affected areas and gently massage the liniment into the skin. Use 1-2 times daily and before bed.